The Motorola DROID RAZR M is equipped with a stock Android ICS gallery. The Default view of the gallery is Albums - it lists all folders with photos in the phone. Rather than the familiar stacks, the app uses a grid of photos, which are two per line. Above each photo you have several sharing shortcuts and a delete button, while below is a line of small thumbnails of all other photos in the album. You can tap those small thumbnails to move to other images or you can just swipe to the side. The settings menu lets you do simple edits to a photo (rotate, crop) or go into a more capable editor with a lot more option. The editor offers light adjustments (so you can bring out the shadows or the highlights), effects, color styles, red eye correction, straightening a photo, sharpening and face glow (which detects faces automatically). Most of these options have a slider that lets you fine-tune the strength of the effect. The video player of the DROID RAZR M is the stock Android one. It supports most popular video formats such as XviD and MKV. You can access the videos straight from the gallery app - there's no dedicated video player button. 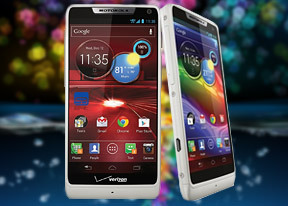 The screen of the Motorola DROID RAZR M (as the name suggests) is perfect for consumption of video content. Large files are also handled easily by the device. The Motorola DROID RAZR M comes with the latest Music app by Google. It has the same side-scrollable tabs like much of the other stuff in Ice Cream Sandwich. Naturally, it offers a link to the Google Play music store as well. The tabs are used to organize your music library - there's Recent, Artists, Albums, Songs, Playlists and Genres. The Now playing interface features the track's album art with the track info and playback controls below it. You can tap it to reveal more options - like/unlike the song, a bar to scrub through the song and shuffle and repeat toggles. From the Settings key you can get into the equalizer. It can be turned on and off and features several presets that along with a user defined one. If you plug in a headset, you can also play with the Bass boost and 3D effect sliders. 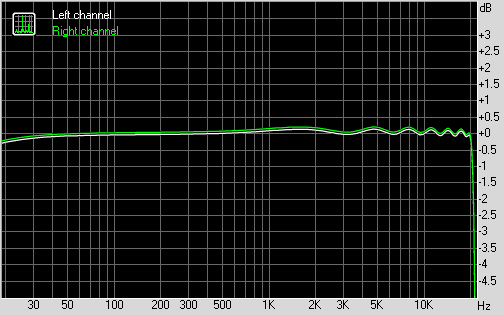 The Motorola DROID RAZR M fared greatly in our traditional audio quality test. The smartphone offers pretty good frequency response as well as excellent signal-to-noise and dynamic range scores. The stereo crosstalk is quite good as well, while the distortion levels are kept well under control. Add the excellent volume levels and you get a really solid overall performance.